The university plans to use the $25,000 to increase the outreach of its sustainabilty initiatives. On Oct. 3, Jasper, Ind.-based National Office Furniture presented a $25,000 Gift of Inspiration to Wright State to support the university’s sustainability and environmentally friendly initiatives. “I see two women over there who I know will make it happen,” he said pointing to Linda Ramey, Ph.D., associated director of Wright State’s Office of Sustainability, and Cathy Sayer, Ph.D., the university’s director of service-learning and civic engagement. Ramey said the university plans to use the gift as seed money to leverage funds for Extending Sustainability Projects. 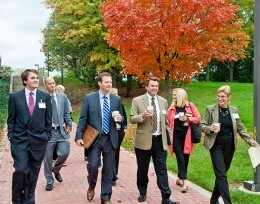 Linda Ramey, Ph.D., (far right) led the visiting on a tour of campus to showcase the university's green programs. 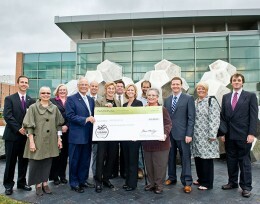 Prior to the check presentation, Ramey led executives from National Office Furniture on a tour of the university’s Dayton campus, pointing out such green initiatives as the Campus Community Garden, new recycling containers and the solar thermal panels on the roof of the Student Union. National Office Furniture began its Gift of Inspiration program in 2009 to provide opportunities for educators and health care providers to enrich lives and communities. The program awards financial gifts that may be used for technology needs, scholarships, training and development programs, or facility enhancements. To date, the company has awarded a total of $135,000 as part of the program.